Decorating with photos, magnets, artwork or inspirational phrases will personalize your storage locker space at school. 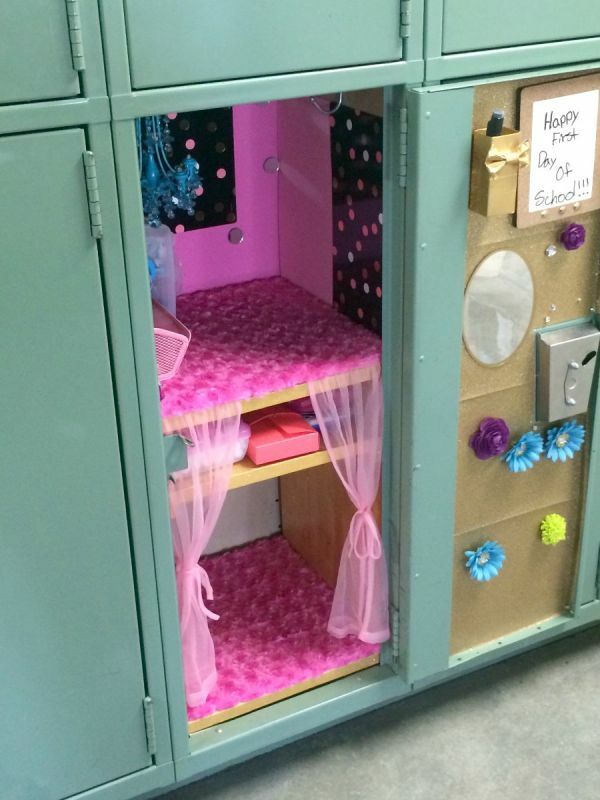 This is a guide about decorating your school locker. 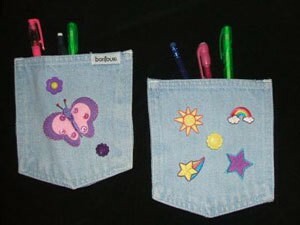 In just a few easy steps, your child can turn an old pair of jeans or shorts into a couple of pen and pencil holders that mount easily in a school locker. Begin by having your child cut each back pocket from the jeans. (Make sure she gets the material it's attached to as well and not just the pocket.) She should cut closely around the three sewn edges of the pocket. Now she can start decorating by attaching any iron-on patches according to the package directions, using fabric paint, buttons, etc. With the pocket face down, cut the magnetic tape into one-inch strips and affix a magnet to each corner of the pocket (add a dab of tacky glue for an even stronger hold, if needed), and it's ready for hanging in a school locker. My daughter bought a few of these decorations at the store, but the rest were made by us in part to save money but also to have them fit her locker better. The magnetic wallpaper was the basis for the black, pink, and gold theme. She also really likes blue so we added a few blue items (flower magnets and chandelier). One issue we had with the magnetic wallpaper was that it was way too small to cover much of the locker surface. 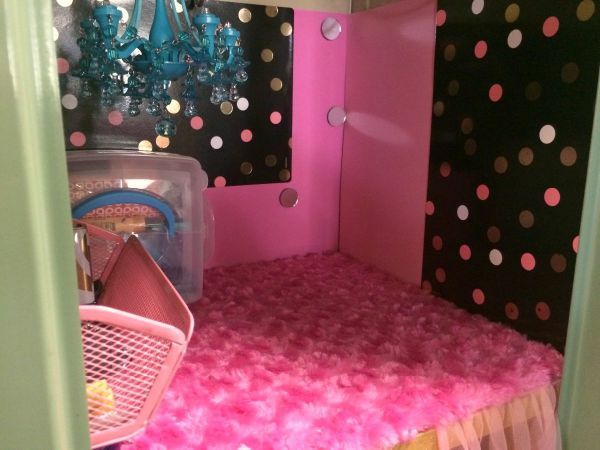 To fix this issue, we used the magnetic wallpaper to hang pink scrapbook paper to cover up more of the locker. Then we made the scrapbook paper wallpaper for the door. Since the scrapbook paper wallpaper needed to be held up with magnets, we made the magnets a little more fancy by attaching rhinestones and small round mirrors to them! The wooden shelves were painted with gold paint and gold glitter. Then we put pink fuzzy "rugs" on the shelves. We tucked the curtains in between the rug and the shelf so that they didn't need a metal surface to hang. 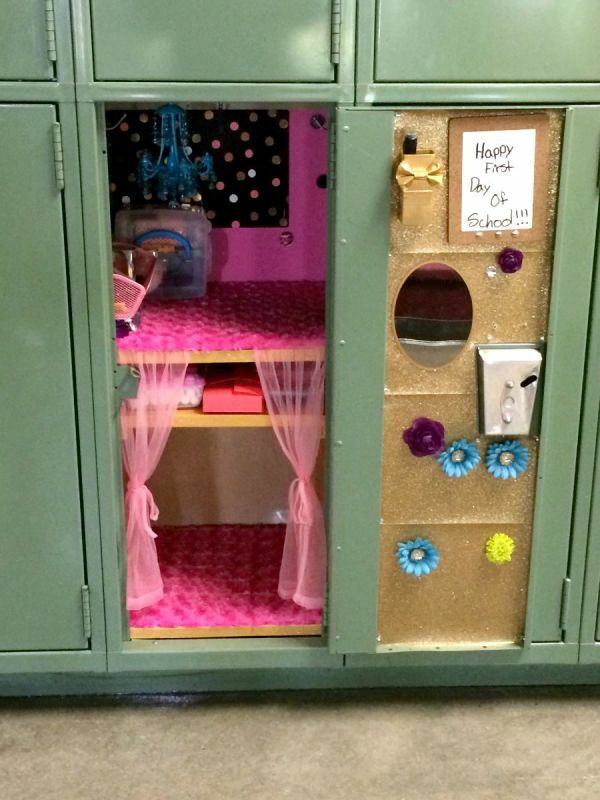 We hope that this inspires you to have fun decorating your locker! My son started middle school this year and he has his own locker. Of course, he wants to "decorate" his locker. I explained to him that stickers and other semi-permanent things would not be good. I am in charge this year of decorating the boys football teams locker room. Anyone have any ideas? The school is Governor Mifflin and the mascot is the Mustangs. Our colors are Maroon and Gold. We decorated last year for sectionals. It was a blast. We are also decorating for the junior high. We used art paper with spray paint to make banners for the hall and made a banner for each class with the jersey#'s or players name.The kids were really surprised. You can buy any color paint just make sure it is safe to use in the school and you can also get glitter and crepe paper. We hung the crepe paper from the ceiling with balloons! Show the players you really appreciate them and all their hard work! 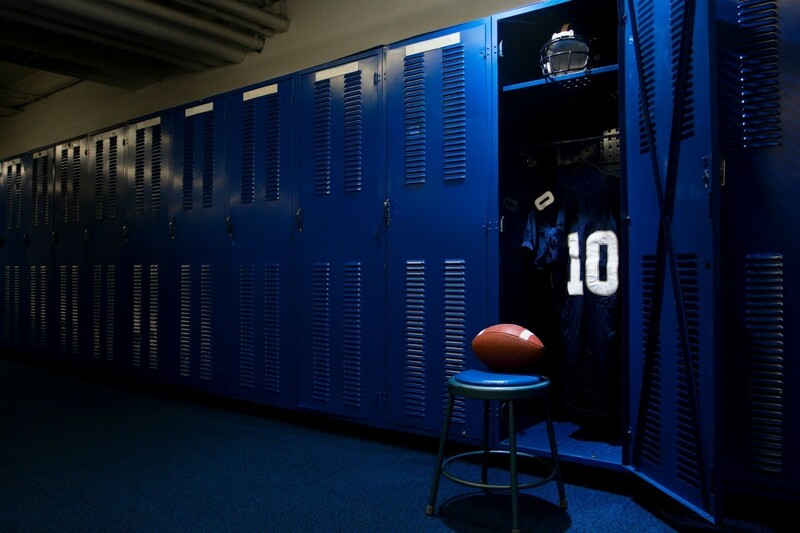 Football lockers are usually for storing football gear but sometimes it may be necessary to decorate them for some reason. This is a guide about decorating a football locker.